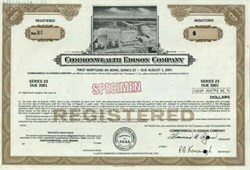 Beautifully engraved specimen certificate from the Commonwealth Edison Company printed in 1982. This historic document was printed by the American Banknote Company and has an ornate border around it with a vignette of on of the company's generation plants. This item has the printed signatures of the Company’s President and Secretary. The Commonwealth Edison Company became UniCom Company in 1994. PECO bought Chicago-based Unicom and became Exelon in 2000. The new company distributes electricity to 5 million customers: 3.5 million in Northern Illinois, through ComEd, and 1.5 million in the five-county Philadelphia region, through PECO Energy. In addition, Exelon distributes natural gas to 425,000 customers in Pennsylvania. Both PECO and Unicom were leading nuclear plant operators, and more than 70% of Exelon's 19,000-MW generating capacity comes from nuclear plants. Other generation interests include AmerGen Energy, a joint venture with British Energy, and Sithe Energies (49.9%); the firm also markets wholesale and retail power.